3D road markings are being painted on streets in Paris in a bid to make motorists slow down. 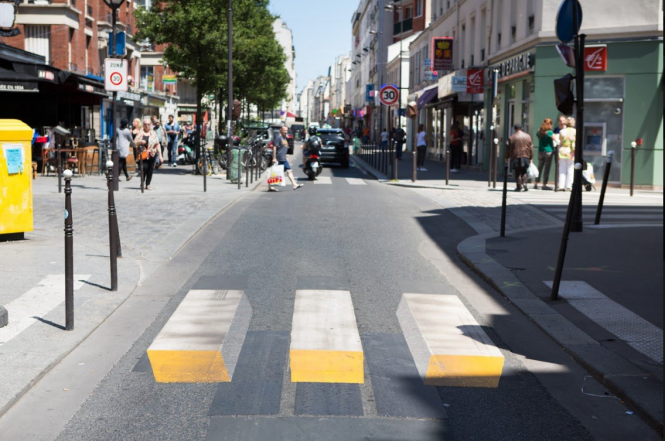 Four pedestrian crossings in 30kph zones are being given the 3D treatment, Mayor Anne Hidalgo announced on her Twitter feed. The Paris scheme follows a successful trial in Cysoing, near Lille. Made by Groupe Helios subsidiary T1 in Santes, the 3D crossing cost twice as much as a normal crossing. It had proved a success in towns in India, Iceland and Belgium. Ms Hidalgo also announced that rainbow crossings, painted in the Le Marais district of the capital as part of Pride fortnight leading to the weekend's Pride March, will be made permanent. One of the original rainbow crossings was daubed with homophobic slurs. The Mairie responded by announcing two additional rainbow crossings would be created. Je condamne et suis profondément choqué par l'acte, violent et homophobe, qui a dégradé les passages piétons arc-en-ciel du Marais.